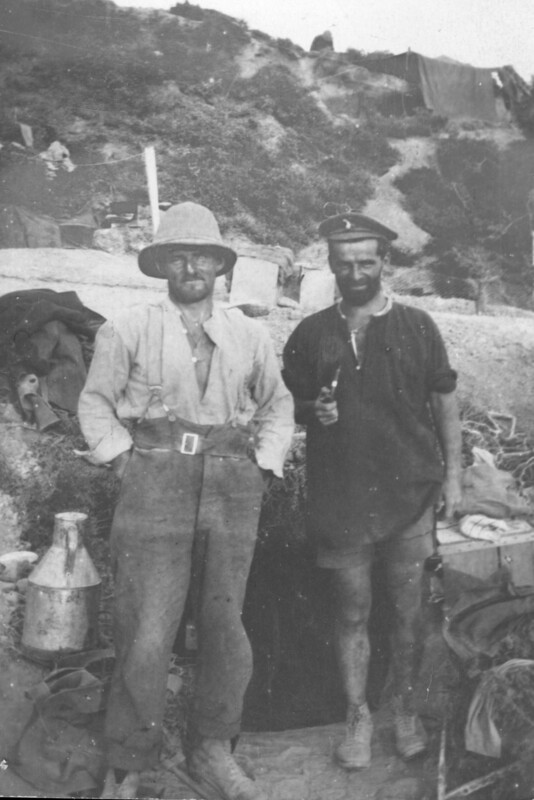 Rupert Pyle (left) and Frank Pyle (right) outside their bivouac at Gallipoli. Photograph 2006.447, Kippenberger Military Archive and Research Library, National Army Museum, Waiouru. David Ferguson, The History of the Canterbury Regiment, NZEF, 1914-1919, Auckland, 1921, pp. 1-3. Richard Stowers, Bloody Gallipoli: The New Zealanders' Story, Auckland, 2005, p.182. Private George Patrick ‘Paddy’ Breeze, No. 6/591 to his Mother [Margaret Breeze], 9th [May?] 1915, in Tony Fraser, ‘Two New Zealanders at Gallipoli’, The Gallipolian, 14 Nov 2003, p.4. Paddy was 25. History-Sheet, George Patrick ‘Paddy’ Breeze, NZEF personal file [PF], R22278677, Archives New Zealand Wellington [ANZ]. Press, 19 October 1915, p.2. Private Richard Sweetman, No. 6/1414 Canterbury Infantry Battalion writing to his brother about the death of Major James Houlker, Nelson Evening Mail, 8 November 1915, p.4. Henderson said he took a “smack on the back from one of Paddy’s legs” as it flew off. ibid. ‘Soldier’s Letters’, West Coast Times, 14 October 1915, p.4, Private Robert ‘Bob’ Henderson to a friend in Hokitika, from 19th General Hospital, Alexandria, 23 August 1915. 6/1474 William Joseph ‘Billy’ Breeze to ‘Dear Mother & Father’ [John J and Margaret Breeze], 18 August 1915, from Mena House, Alexandria, in Tony Fraser, ‘Two New Zealanders at Gallipoli’, The Gallipolian, 14 Nov 2003, p.4. Another brother Mark B Breeze, No., 22/53 was wounded at Messines, only to drown in Wellington Harbour in 1928, aged 31. History–Sheet, William Joseph Breeze PF, R22278684, ANZ. Mount Ida Chronicle, 19 November 1915, p.3; History-Sheet and attestation form, Frank Mortimer Pyle PF, R20803513, ANZ; History-Sheet and attestation form, William Rupert Pyle PF, R20803517, ANZ. Mount Ida Chronicle, 19 November 1915, p.3. Entry 7 August 1915, Frank Pyle diary, Kippenberger Military Archive and Research Library, Waiouru. Ibid. ; Keith Douglas Scott, Before Anzac Beyond Armistice: the Central Otago Soldiers of World War One and the Home they left Behind, Auckland, 2009,, pp.92-96; Terry Kinloch, ‘Full Cry for the Dardanelles’ in Don Mackay ed., The Troopers’ Tale: The History of the Otago Mounted Rifles, Dunedin, 2012, p.186; Rupert is buried in the Commonwealth War Graves Commission’s No.2 Outpost Cemetery. As quoted in Scott, p.130. As quoted in Scott, p.92. History-Sheet and related papers, Frank Mortimer Pyle PF, ANZ. Ibid., p. 131; History-Sheet, Wilfred Graham Pyle PF, R20803515, ANZ.